Pakistan's relief efforts to aid Nepal earthquake victims went unnoticed by the hostile Indian media until some doctors from India "discovered" beef packets in the relief material brought in by PAF cargo planes to Kathmandu. This "discovery' then triggered the shameless 24X7 anti-Pakistan propaganda in the mainstream Indian media that was unsparing even amidst the horrific death and devastation suffered by the Nepalese people. Pakistan's humanitarian relief supplies in response to the tragic suffering of the Nepalese earthquake victims included available emergency stock of MREs (Meals Ready to Eat) that were specially prepared for Pakistani military by PANA foods. It is possible that the relief supplies contained some beef packets which were clearly marked, as Pakistani foreign ministry spokeswoman Tasneen Aslam explained: "The Meal Ready to Eat (MRE) is a pre-packed kit of 20 items for a full day's meals. On each and every packet inside the kit the name of the dish is clearly written in English and Urdu so that people may choose whatever they like to eat or discard." An Indian reporter of The Daily Mail quoted Dr. Singh, a doctor from India, as saying, “When we reached the airport to collect the food items from Pakistan, we found packets of ready-to-eat meals, including packets of ‘beef masala’. There were other food items too." It seems that the Indian media and Hindu Nationalists have become obsessed with cows and beef since the election victory of Prime Minister Narendra Modi last year. 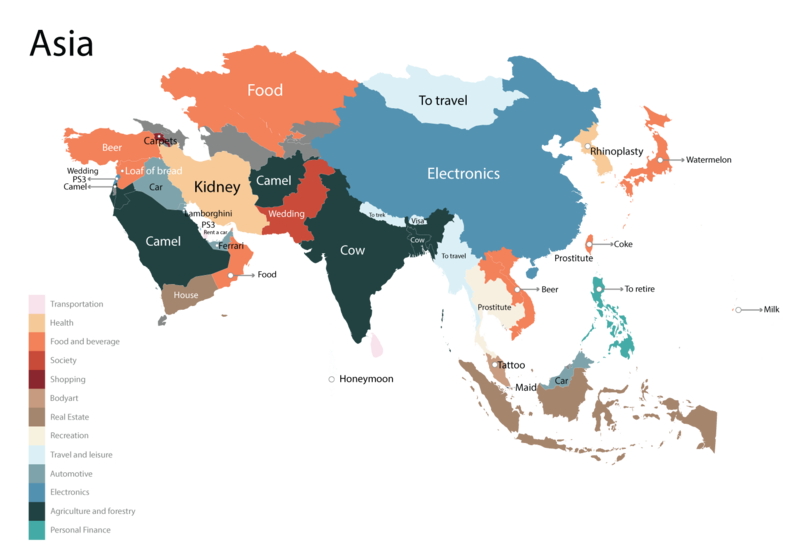 It has been recently reported by Business Insider that "cow" is now the most googled product in India. It seems to have been prompted by the beef bans now spreading across Indian states. The most googled product (service) in Pakistan is that of wedding-related products and services. This is not the first time that Indian media have whipped up war sentiments against Pakistan; there are many many past examples. In January 2013, India accused Pakistani soldiers of beheading an Indian soldier at the Line of Control in Kashmir. Barkha Dutt, a hawkish TV anchor at NDTV, led the Indian media charge against Pakistan by accusing Pakistani military of "savagery" and "barbarism". Indian prime minister talked of "no business as usual", and Indian Army chief told his "commanders to be aggressive and offensive" and the Indian Air Force chief threatened to use "other options". Pakistan's offer to have the incidents independently investigated by the United Nations was rejected. All the talk of "Aman Ki Asha" went out the window when Pakistani hockey players were unceremoniously ejected from India as the right-wing Hindu organizations were aided and abetted by the hawkish anti-Pakistan Indian media. Hindu Nationalist BJP leader Sushma Swaraj demanded "ten Pakistani heads for one Indian head". Soon, Barkha Dutt's phony outrage and Sushma Swaraj's bloodthirsty rhetoric about "beheading" were exposed by a quick Google search by Najam Sethi. Sethi found an article in a Nepalese publication Himal in which Barkha described how she was shown a severed head of a Pakistani as war trophy by an Indian Army officer in Kargil in 1999. "It was April, 2000, almost a year since the war between Pakistan and India over Kargil in Kashmir had ended, and the newspapers which the delivery man threw on to my terace every morning still portrayed Pakistan as a rogue state, governed by military cowboys, inhabited by murderous fundamentalists: the rhetoric had the patina of hysteria." Can we deny the fact that every new terror attack on the Pakistani establishment, every development that marks a further decline in the authority of its government is greeted with an utterly unconcealed sense of delight? This is not just the mood of the mobs here. Even the “intelligentsia”, the TV talking heads, opinion page columnists, government spokespersons, all have the same smug air of “I-told-you-so” and “so-what-else-did-they-expect” satisfaction. And they ask the same patronising question: hell, can Pakistan be saved? it was an honest mistake.But,pakistan should have accepted and apologised rather than starting a blaming game with india. Mohd: " it was an honest mistake.But,pakistan should have accepted and apologised rather than starting a blaming game with india." You r forgetting that Nepal people were not taking the Pakistani aid just because of beef. Mohd: " You r forgetting that Nepal people were not taking the Pakistani aid just because of beef." Mohd said >>You r forgetting that Nepal people were not taking the Pakistani aid just because of beef. When a man is dying, he pays less attention to the content of the food. These hindus are so obessed with us, like an ex girlfriend. #GoHomeIndianMedia trending in Nepal after insensitive Indian media coverage of Nepal earthquake. 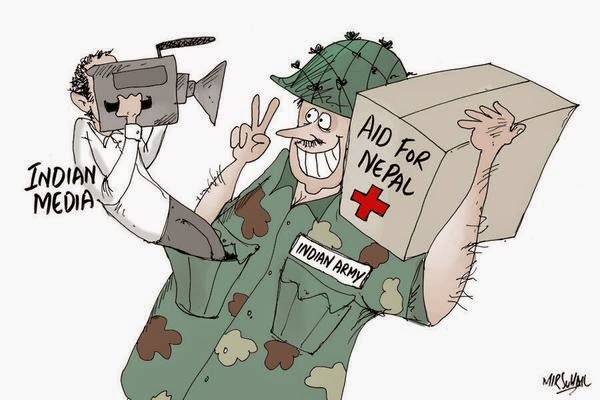 One biting (Nepalese) cartoon showed a (Indian) TV reporter in the pocket of a gleeful Indian soldier posing with a box screaming Aid for Nepal. "The shrillness, jingoism, exaggerations, boorishness and sometimes mistakes in coverage have rankled the host community," Kanak Mani Dixit, editor of the highly respected Himal magazine, tells me. Indian media's overdependence on access-based journalism means that a disproportionate amount of coverage often ends up on eulogising how their government and its agencies handle crises - there was similar criticism of the media's coverage by flood-affected people in the Kashmir Valley last year. Some channels also pretty openly identify themselves with the ruling government and the bias is amply reflected in the coverage. "The mainly social media backlash in Nepal does point to an irritation of local people with the way their tragedy has been covered by India," says Kanak Mani Dixit. "It is possibly time now for India's news channel to introspect and give some due respect to the host country." There are mounting worries at home over the declining quality of Indian media and what many call the "tabloidization of news". Also, more disturbingly, as Prannoy Roy, chief of India's leading NDTV news channel worries, "Why is India becoming 'no country for honest journalism'?" 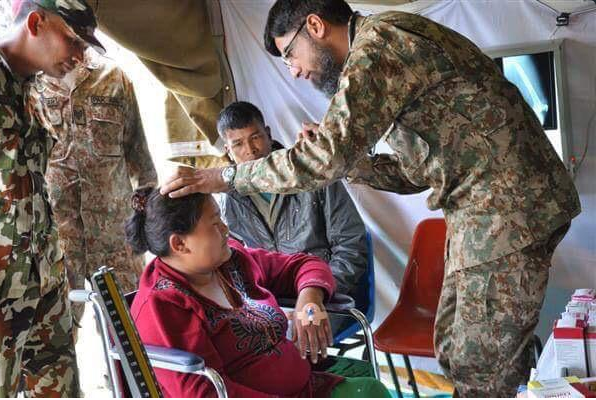 The second baby to be born in a Pakistan Army field hospital in Nepal since the devastating earthquake on April 25, has been named Pakistan in honor of the country that aided its birth, the news website Dawn reported citing Inter-Services Public Relations on Monday. The field hospital was built by the Pakistan Army to support relief efforts in earthquake-struck Nepal. During a visit by Nepal Army Chief General Guarav SJB Rana to a Bhaktapur field hospital on May 3, he expressed ‘his gratitude over the support extended by Pakistan’ through the army, and that the country would always be remembered by the people for providing medical care and supplies to the victims of the earthquake. The Indian team seemed to only be concerned with rescuing Indian nationals residing in Nepal. TIA was overcrowded due to hundreds of Indians waiting to be airlifted and a large number of Indian planes parked at the runway. This caused utter chaos since it disrupted the schedule of other planes that had to land. For instance, a plane from China had to be sent back because the airport was overflowing with Indian planes and passengers. A TIA official stated that TIA was virtually being controlled by Indians. The reason behind this gaping difference in rescued people was that the Indian aircraft was only concerned with airlifting Indians; moreover, they reported this incident on Indian news channels under the pretence that Indians are rescuing Nepalese survivors – and not just Indian nationals. Apart from this incorrect coverage, India has been vocally anti-Pakistan since the beginning of this tragedy. Online media reported that India hinted to the Nepalese foreign ministry to not allow Pakistani support through, ensuring that India would do everything instead. However, the foreign ministry did not oblige to India’s request and Pakistani aid started to pour into Nepal, in the form of sacks of eatables and relief materials. The Indian media kept a close tab on Pakistani goods and searched every possible loophole to blame the Pakistanis in some issue or the other. Later on, the Indian media reported that Pakistani relief materials contained ‘beef masala’. This became a topic of controversy since the relief packages were sent to a Hindu-majority republic. Despite this official clearance on the accusation and no statement by Nepal, the Indian media are turning the issue into a propaganda aimed at derailing relations between Pakistan and Nepal. Many Nepalese were saddened by the Indian propaganda which was aimed at damaging Nepal’s proximity with Pakistan. Officials at the Nepalese Press Council, Nepal’s media monitoring authority, and the former chairperson of the organisation of Nepali journalists, Suva Gaule, and many other Nepalese were critical of India’s anti-Pakistan activities in Kathmandu, as reported by Nepal’s popular online news portal onlinekhabar.com. Hindu volunteer organisations and its activists are at the forefront of the anti-Pakistan activities in Nepal. Popular yoga guru, Ramdev, was at the forefront of the beef propaganda, as was obvious from his Facebook updates. However, beef masala was not of any concern amongst Nepalese citizens. Instead, numerous famous artists and citizens staged a demonstration against unnecessary Indian interference in Nepal. Nepal is a Hindu-majority Himalayan nation; it is not a ‘Hindu kingdom’ as described by India’s Zee News. Nepal is a federal democratic republic as well as a secular nation. True, the Nepali Civil Code Amendment 1990 has made cow-slaughtering punishable by 12 years in prison, but, it does not mean imported beef items are completely banned. No Nepali law states a ban on beef items from foreign countries. At present, Kathmandu’s star hotels import beef items to serve foreigners. The entire point of sensationalising such a petty issue only reflected badly upon the Indian government, not Pakistan. India's reaction to Nepal's new constitution and the violence preceding and following it, has been criticised by Nepal's media and Twitter users. The Indian government expressed "concern" over the constitution and on Monday recalled its ambassador to Nepal for urgent consultations. Since then, leading Nepalese newspapers have been criticising what they see as interference. More than 40 people have been killed in protests in areas adjoining India. "Certainly, while drafting the constitution serious problems have erupted in our country," says the prominent Nepali paper Kantipur, but goes on to add that "it is for us to solve these problems". "A neighbouring country's coming into the picture, or its being invited to solve our internal problems and challenges, is not acceptable at all," the paper says. The English-language Kathmandu Post says in an editorial that "Delhi would do well not to be seen as crossing the red line to meet its objective. It could box itself in a difficult position and see it lose its diplomatic leverage against certain parties and sections of the polarised society". My Republica, another English daily, carries a prominent story on how former Nepalese diplomats find Delhi's response "inappropriate". "If India involves itself in the micromanagement of its neighbouring countries, such a move may give a wrong message to the international community," the paper quotes Shankar Sharma, Nepal's former envoy to the US, as saying. Another paper, The Rising Nepal, adds: "In all, India has not yet supported the new constitution, which many fear would invite trouble in the shape of rousing disturbances in the Terai region which borders India." Meanwhile, the response from Nepalese Twitter users has been even stronger, with the hashtag #backoffIndia trending worldwide till late on Tuesday, with more than 180,000 tweets posted on the day. The violence in Nepal is also said to be affecting the supply of fuel in the capital, Kathmandu, and other major towns. Nepal relies on India for fuel but reports say many truckers are wary of entering Nepal because they fear violence from clashes between protesters and police. Twitter users in Nepal are concerned about this, with some accusing India of deliberately stopping the fuel supply. Kathmandu: Nepal has urged China to reopen the two trading points on the Sino-Nepal border at the earliest amid problems along the border with India, media reports said on Friday. Amid a diplomatic standoff with New Delhi over Nepal's new constitution and continuous unrest in the country's southern border with India, Kathmandu is now mulling an alternative to do business with China. India and China are landlocked Nepal's two giant neighbours. Nepal is surrounded by India from three sides and China on the north. Nepal's over 90% trade and economic activities are with India as nationals from both sides do not need visa to travel to each other's country. According to Nepali media reports on Friday, with the supply of essential commodities being hit by disturbances at major custom points in the southern plains, the government has urged Beijing to reopen trade routes that have remained out of operation following the April 25 earthquake. Officials from the ministry of commerce and supplies of Nepal held talks with Chinese embassy officials here on Wednesday and Thursday. They requested Chinese assistance for an early reopening of custom points at Tatopani and Rasuwagadhi, two key trading points between Nepal and China. "With major festivals like Diwali and Dussehra around the corner, we have requested China to resume border operation as soon as possible," said Naindra Prasad Upadhyaya, secretary at the ministry. He added that the Chinese authorities had responded positively. The Rasuwagadhi route came into formal operation in December 2014. Since the April earthquake, the trade routes of Barabise-Tatopani-Khasa and Nuwakot-Rasuwagadhi-Kerung have remained closed. According to the ministry, the Chinese government has been undertaking road repair on its side of the border. "We are ready to open the border as soon as the Chinese side completes work on their end." Upadhyaya said a meeting of the Central Monitoring Committee of Nepal on Thursday also decided to ask China for speedy road repair in Kerung (Rasuwagadhi). The meeting also decided to coordinate with the ministry of physical infrastructure and transport to clear roadblocks on the Araniko highway in order to request the Chinese side to reopen the Tatopani customs point. In his speech at the United Nations General Assembly yesterday, Pakistan's Prime Minister Nawaz Sharif made a direct proposal to India to normalize relations. India immediately and summarily rejected his overture, blaming Pakistan for terrorism and taking strong exception of his description of Indian-administered Kashmir as a foreign occupied territory. In the never-ending saga of India-Pakistan relations, it is usually Pakistan that looks like the party that does not want peace. It is Pakistan that gets blamed for terrorist attacks in India, heightened military confrontation on the disputed Kahsmir border, or militant incursions. Now, with New Delhi not responding even to very specific Pakistani proposals for reducing tensions, India risks being seen as the party that is shunning dialogue and peace. The Pakistani prime minister proposed putting into a signed document the 2003 ceasefire agreement. Back then, India and Pakistan did not sign that agreement due to diplomatic differences over phraseology. Nevertheless, the 2003 agreement did result in substantially reducing tensions on the disputed Kashmir border, at least until 2013. Over ten years, a lot of military and civilian lives and property were saved. Signing such an agreement can only be in India's interest. India instead blamed Pakistan for ceasefire violations. It is true that Pakistan's ceasefire violations in Jammu and Kashmir are often aimed at helping militant incursions, but it is not as if India doesn't respond to them. An objective outsider can never tell what the two armies - standing eye to eye on a volatile disputed border - are up to. That is why the monitoring mechanism of the United Nations Military Observers Group in India and Pakistan, better known as UNMOGIP, can only be to India's advantage. While Pakistan wants an enhanced role for UNMOGIP, India would rather have UNMOGIP's international observes pack up and go home. India says that Kashmir and other disputes are strictly between India and Pakistan, and that the two countries signed an agreement in 1972 that there would be no third party. However, Nawaz Sharif did not seek the UN's intervention in mediation, or dispute resolution. Indeed, India is missing the departure from the strict Pakistani line that Kashmir needs a plebiscite under the UN Security Council resolutions. That is the usual Pakistani rhetoric meant to go nowhere. But Nawaz Sharif this time tried to show meaningful intent by proposing that India and Pakistan reaffirm that they will not use, or even threaten to use, force against each other. India could take this up and demand commitments from Pakistan on terrorism, asking Islamabad to walk the talk and bring to justice the perpetrators of the terrorist attacks in Mumbai in 2008. India could also ask Pakistan to reciprocate India's commitment to not be the first to use nuclear weapons. Nawaz Sharif proposed demilitarization of Kashmir, to which India has responded by saying that the real solution is “de-terrorizing Pakistan”. However, Pakistan did not demand demilitarization of only India-administered Kashmir. This would apply to both sides of the disputed border. India knows better than anyone that Pakistan's terrorist infrastructure is centered in Kashmir. India could demand linking demilitarization of Kashmir to Pakistan shutting down Kashmir terrorist groups such as Lashkar-e-Taiba. It is bizarre that India is unwilling to seriously talk to Pakistan to achieve peace and stability in the region. Military action against a nuclear-armed Pakistan is not an option for India. Pretending that Kashmir is not a dispute is not viable. Pakistan is India's greatest foreign policy challenge and India's answer seems to be disengagement. Talks announced in July went nowhere; they were announced clearly under international pressure. India and Pakistan both typically blamed each other for the failure of talks. India said it would not let Pakistan pay even lip-service to the Kashmir issue and won't let Pakistanis meet Kashmiri secessionists. Now, with Pakistan making specific proposals to bring down tensions, it is looking difficult for India to make Pakistan look like the party that does not want peace. In this game of play-acting before the international community, India thinks it can isolate Pakistan. But, India might be punching above its weight because Pakistan's geographic location makes it important to the international community. To keep the Taliban in check in Afghanistan, the world needs Pakistan. Deepening Pakistan-China relations have also been a cause of concern for India. Given these circumstances, it would be fruitful for India to accept Nawaz Sharif's overture, sit down for talks, show serious intent, and not put forward unreasonable and pointless demands. Should there be another Pakistan-backed terrorist attack in India, it will be Pakistan, and not India, that will look like the party in the wrong. China is to supply fuel to its impoverished neighbour Nepal for the first time, amid a halt in Indian supplies that has severely disrupted life in the mountainous country still struggling to recover from April’s massive earthquake. Nepali officials flew to Beijing on Monday to negotiate the terms of the petroleum purchase deal, which will in effect end the longstanding role of India’s state-owned Indian Oil Company as Nepal’s monopoly fuel supplier. Nepali government officials have said the initial transaction will lead to China providing 1.3m litres of fuel, but analysts suggest it could evolve into a long-term arrangement that would end Nepal’s dependence on India. The deal comes as Nepal and its 28m people face crippling fuel shortages amid severe disruptions to supply from India. New Delhi denies imposing a deliberate fuel blockade on its poorer neighbour, blaming the disruption on the unwillingness of Indian truckers to pass through parts of Nepal where residents are protesting — sometimes violently — against a recently adopted constitution. But after nearly a month of fuel and cooking gas shortages, most Nepalis believe the crisis is the result of New Delhi seeking to force the country to change the document. Nepal’s constitution — crafted after more than nine years of tortuous negotiations — was adopted in September with a two-thirds majority of Nepal’s elected constituent assembly. But it has been criticised by members of the Madhesi community, which lives in Nepal’s plains, accounts for 32 per cent of the total population and has close ethnic, cultural and social ties with people from the adjacent regions of neighbouring India. Many Madhesi politicians are aggrieved that the plains — home to about half of Nepal’s population, including people from other ethnic communities — was not designated as a distinct province but divided into different parts of multiple provinces. Madhesis have seen this drawing of state boundaries as a deliberate plot to weaken their political influence. New Delhi has not called publicly for any particular changes, but has urged Nepal to find a “mutually acceptable solution” that will satisfy all parties. The tension between Kathmandu and Delhi is an unfortunate turn in a relationship that was poised for strong improvements a year ago, when Prime Minister Narendra Modi became the first Indian premier in 17 years to visit Kathmandu. In an emotional address to Nepal’s constituent assembly in November last year, Mr Modi won many hearts by speaking in Nepali, emphasising the ancient cultural, spiritual and social ties between the two countries, and promising to help boost Nepal’s physical and economic “connectivity” to India. India also won many hearts with its rapid rescue and relief efforts after Nepal’s devastating earthquake in April. Underlining the growing role of China in South Asia, Nepal on Monday secured transit rights through China following an agreement in Beijing between Prime Minister K.P. Sharma Oli and his Chinese counterpart Li Keqiang. Earlier, China extended a ceremonial welcome to Mr. Oli who held official talks with the Chinese leadership. News reports said Mr. Oli would also conclude agreements on building of multiple train routes connecting Nepal with China’s key production centres. However, playing down the impact of the agreements between Nepal and China, official sources told The Hindu that the future of the agreements depended on the issue of “economic viability” of the transit facilities and train connectivity projects. The Ministry of External Affairs, however, refused to issue an official statement immediately, considering that the agreements were between two sovereign countries. However, officials pointed out that India-Nepal ties could not be compared or curtailed by Nepal’s agreements with China. “After all, 98 per cent of Nepal’s third country trade goes through India and to the port of Kolkata,” an official pointed out. India at present has two rail lines under construction and three more are being planned to increase Nepal’s trade ties. During the February visit of Prime Minister Oli to New Delhi, India agreed on giving dedicated access to Nepal to the port of Vizag. Officials pointed out that in comparison to the Nepal-China agreement, India and Nepal had 25 crossing points, two integrated checkpoints and 2 more checkpoints were under construction. Even as official sources played down the impact of the transit rights through China, Nepal Prime Minister K.P. Sharma Oli clinched in an agreement with his Chinese counterpart Li Keqiang in Beijing on Monday and other proposed agreements for rail connectivity, diplomat and academic Dr. S.D. Muni pointed out that the development represented “a challenge not just for India but for entire South Asia.” However, he cautioned, it should not trigger a panic reaction from India. Dr. Muni pointed out that China would have to ponder about how it could implement a rail and transit agreement for Nepal without opening up the Tibet region to the world. “Rail connectivity from Nepal to China will be used by the non-Chinese to travel to China through Tibet. Will China open up Tibet to facilitate connectivity for Nepal?” asked Dr. Muni. The agreements, however, will take some time before being implemented on the ground and political developments may impact the deals concluded. However, Dr. Muni pointed out that the implementation of the deals would depend on how far China was willing to invest in Nepal considering the economic and political risks associated with the deals. However, as of Monday, Nepal could not seal a vital fuel supply agreement with China which Nepali sources said would also come up for detailed discussion during the seven-day visit of Mr. Oli to China. “Historically, the Himalayas were seen as barrier but now the Himalayas can be a connector between Nepal and China,” said Mr. Dixit, underlining that transit and train agreements will create new dynamics in South Asia. The murders of journalists Rajdeo Ranjan in Bihar and Akhilesh Pratap Singh in Jharkhand within 24 hours of each other confirmed a 2015 international report that named India among the three most dangerous countries for media personnel. Since 1992, 64 journalists have been killed in India with reporters exposing corruption the most hunted, says a compilation by the Committee to Protect Journalists. Most of them died in smaller towns where graft is rampant and exposing it means earns the wrath of powerful politicians and industrialists. Earlier this year, a group backed by the Chhattisgarh government forced journalists Malini Subramaniam and some lawyers out of the Maoist-affected Bastar region. Activists also said the state administration was muzzling free speech after three journalists were arrested on allegedly flimsy charges. The high death rate of journalists in the country is only lower than war-torn Iraq and Syria. India is the deadliest nation for reporters in Asia, more than Pakistan or Afghanistan. most Indians assume, their media are freer. When Cyril Almeida, a Pakistani journalist, revealed earlier this month that he had been banned from travelling abroad after writing a story that embarrassed Pakistan’s security forces, India’s tabloid press gloated. The Schadenfreude proved short-lived. To general surprise, Mr Almeida’s colleagues rallied in noisy support. Pakistani newspapers, rights groups, journalists’ clubs and social media chorused outrage at his persecution. The pressure worked; the ban got lifted. On the Indian side of the border, however, there has not been much critical examination of the government’s actions. Instead, Indian media have vied to beat war drums the loudest. When an army spokesman, providing very few details, announced on September 29th that India had carried out a retaliatory “surgical strike” against alleged terrorist bases along the border, popular news channels declared it a spectacular triumph and an act of subtle statecraft. Some anchors took to describing India’s neighbour as “terror state Pakistan”. One station reconfigured its newsroom around a sandbox-style military diorama, complete with flashing lights and toy fighter planes. A parade of mustachioed experts explained how “our boys” would teach Pakistan a lesson it would never forget. Such jingoism was predictable, given the fierce competition for ratings among India’s news groups. Disturbingly, however, the diehard nationalists have gone on the offensive against fellow Indians, too. This month NDTV, a news channel with a reputation for sobriety, advertised an interview with Palaniappan Chidambaram, a former finance minister from the opposition Congress party. Mr Chidambaram was expected to say that previous governments had also hit back at Pakistan, but with less fanfare than the present one. Abruptly, however, NDTV cancelled the show. An executive sniffed that it was “not obliged to carry every shred of drivel” and would not “provide a platform for outrageous and wild accusations”. Arnab Goswami, the anchor of a particularly raucous talk show, has declared that critics of the government should be jailed. Extreme nationalists in Mumbai, India’s commercial capital, have urged filmmakers to ban Pakistani actors. One party has threatened to vandalise cinemas that dare show a Bollywood romance, “Ae Dil Hai Mushkil”, due for release later this month, which features Fawad Khan, a Pakistani heartthrob. The film’s director, Karan Johar, has aired a statement declaring his patriotism, explaining that the film was shot before the current trouble and promising never again to work with talent from “the neighbouring country”. One commentator described his performance as akin to a hostage pleading for mercy. Why, asks Mr Chidambaram, are the media toeing the government line so slavishly? Some answer that they have become ever more concentrated in the hands of big corporations, many of which carry heavy debts and so are wary of offending the party in power. Others ascribe the shrinking space for dissent to the unchecked rise of chauvinist Hindu-nationalist groups. Repressive colonial-era laws on sedition and libel also play a part. So we must have that confidence. As there is no fact that needs to be added, no point in law that needs to be added after the person who has been the shield of freedom in India, Mr Fali Nariman, has given us such a good exposition. I will address the question which (journalist) Nihal Singh sahib proposed. The question is: What should we do? And as Mr Kuldip Nayar said, it is not necessary to answer this question, at the time of the Emergency, but the fact of the matter is every generation is taught the lesson of freedom. So this time, once again that lesson has begun. The first thing we must do is to recognise that a new phase has begun. Because thus far the government was using two instruments. One was to stuff the mouth of the media with the bribe of advertisements. There is a Zulu proverb that a dog with a bone in its mouth can't bark. So, they were converting the media into a dog with the advertisements in its mouth that cannot bark at them. But perhaps the biggest reason people rejected the NC this time has to do with the 2015-16 shutdown of the Nepal-India border. As the Congress has always been close to New Delhi, its leaders were at the time seen as mincing their words in condemning the ‘Indian blockade’. But while they vacillated, Oli and his comrades felt no such qualms. They openly blamed India for bringing misery to Nepalis. Deuba and company were seen as weak and doing ‘India’s bidding’. In contrast, Oli came across as a strong nationalist leader who was not afraid to call a spade a spade. Oli, the blockade-time prime minister, got the credit for courageously standing up to the ‘Indian bully’. Oli back then also signed the landmark trade and transit agreements with China. These agreements ended Nepal’s total dependency on Indian ports for business with third countries and put paid – at least in terms of optics if not reality – to India’s monopoly on the supply of fuel. Both these acts were seen favorably by Nepalis who had felt humiliated by India’s highhandedness during the standoff. India-bashing has traditionally been a foolproof electoral strategy in Nepal, and Oli milked it. Speculations are rife that with the Left alliance poised for at least a simple majority, and very likely a two-thirds majority, the new government under Oli will firmly align with China. But this would be an over-simplification of the ground realities in Nepal. Oli understands very well – as does Prachanda, who in 2009 lost his prime minister’s chair after angering India – that no government in Nepal can afford to be seen as openly anti-India. Former Indian foreign secretary Shivshankar Menon rightly refuses to label Oli ‘pro-China’ and thinks of him as ‘just another politician doing whatever is convenient to get to power’. Oli, who was until a few years ago among India’s most trusted lieutenants in Kathmandu, embraced the pro-China nationalist image because he knew it would pay off electorally. But once in power, he will not need to be so openly hostile to India and will, in all likelihood, make efforts to mend his frayed ties with New Delhi, safe in the knowledge that there is no immediate threat to his government.